Announced They Would Seek Re-Election? Answer: Trumka has ensured them the job. Trumka Group can’t lose at the convention. It may seem puzzling to union members, but with the AFL-CIO’s 2013 Convention in Los Angeles only eight months away, no top officer and member of the Executive Council has announced that he or she plans to run for re-election. Don’t be fooled. They are hungry for re-election. With only nine months before the start of the AFL-CIO’s 27th convention, unions are beginning to elect delegates and prepare resolutions to describe how they feel about Richard Trumka and his group of sell-serving, self-perpetuating bureaucrats, who have had a hammerlock on the organization’s policies and activities. position of President of the AFL-CIO. This is not a frivolous decision. Harry Kelber, editor of The Labor Educator, received the prestigious George J. Kourpias Award for Excellence in Labor Journalism. at the Machinists union's 38th convention in Los Angeles on Sept. 9-14. Mr. Kourpias, who was I.A.M. president from 1989 to 1997, began his career as a young machinist in Sioux City, Iowa in 1952. He is especially noted for his leadership as President of the Alliance for Retired Americans, representing more than three million members, with a mission to "support public policy that protects the health and economic security of the country's senior citizens." "On his 98th birthday, professional rabble-rouser and Brooklyn Heights resident Harry Kelber announced he will run for president of the American Federation of Labor and Congress of Industrial Organizations. No, not the local chapter of the nation’s largest labor group — the activist born during the Wilson administration wants to be in charge of the entire 11-million worker organization, better known as the AFL-CIO. The Brooklyn Paper’s Danielle Furfaro visited Kelber and talked about his campaign, his life, his views on labor, and the era when a pony ride cost about the same as a haircut." 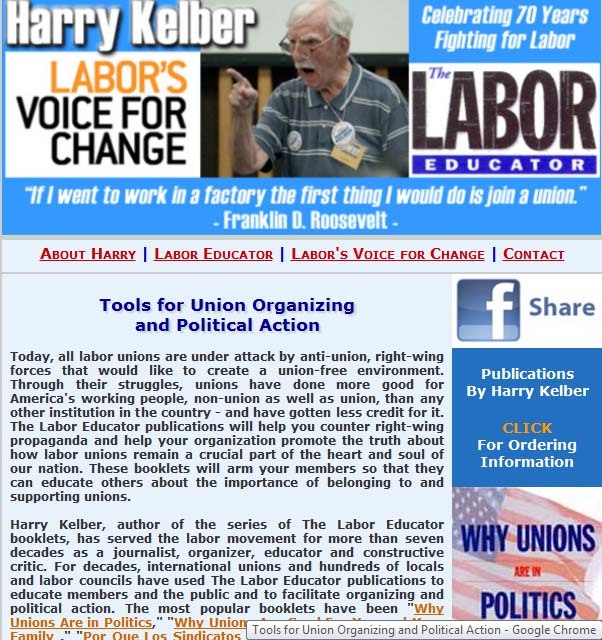 When Harry Kelber announced his intention to run for president next year of the nation’s largest labor organization, he carefully planned his campaign message. But he also had something else to plan — his 98th birthday party. Nearing 98, Harry Kelber is still pushing the labor movement to do better and fulfill its potential. Over eight decades in the labor movement, Harry Kelber has been a rank-and-file union leader, an author and an academic. At 25, he edited two weekly labor newspapers. At 57, he helped found a labor college at Empire State College. At 81, he ran for AFL-CIO vice president. Now 97, he writes three columns a week for his website, The Labor Educator. The Nation talked to Kelber about his experience of the labor movement’s past, his critique of its present and what he sees in its future. What follows is a condensed and edited transcript of our conversation. I’d like you to meet a great labor activist. His name is Harry Kelber. He’s 97. “I’ll be 98 in June,” he tells me. "Harry Kelber will challenge Richard Trumka for the presidency of the AFL-CIO at the labor union’s convention September 8-12, 2013 in Los Angeles. Remember Harry Kelber? He’s a labor activist and writer who runs The Labor Educator. Every week, Kelber evicerates the leaders of the AFL-CIO for not actively challenging the corrupt corporate establishment in Washington, for paying 131 of its executives more than $100,000 a year, and for censoring any criticism of the wars in Iraq and Afghanistan. In June 2011, Corporate Crime Reporter (CCR) interviewed Labor Educator Harry Kelber. Here is a link to CCR's website and the interview. 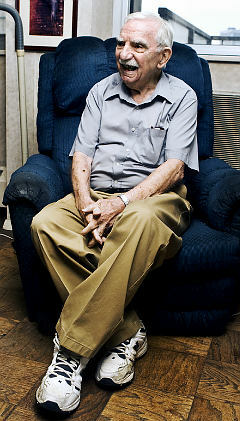 "At one time, Harry Kelber – who just turned 97 last week – was a conservative. "But that was in high school." “Why should I listen to anything Harry Kelber says?” exclaimed a visibly indignant Richard Trumka, president of the AFL-CIO. Maybe because Kelber, 98 years young, has been honestly fighting for labor rights as a worker, union organizer, pamphleteer, author, professor and overall hairshirt of the moribund organized labor movement for 78 years–or 15 years before Trumka, the former coal miner and United Mine Workers’ president, was born. Video, "AFL-CIO Tops Rig 2009 Election Rules To Stop Candidate Harry Kelber From Running"
Harry Kelber, a labor educator and journalist was prevented from running as a candidate for the AFL-CIO 2009 Executive Board election. Although there are 43 spots available no other candidates have even sought to get elected. In order to prevent Harry from running as he did at the last election the rules have been changed illegally to violate the constitution. Click here or above to watch video. 1. During the Great Depression, Harry led a four-month strike at a major food market in Brooklyn, N.Y, that ended with a good union contract. 2. At age 25, Harry was editor of two independent weekly labor newspapers that covered CIO organizing campaigns, as well as the activities of teamster and construction unions. 3. At age 50, Harry earned a B.A. from Brooklyn College and an M.A. and PhD. from New York University - all within 5-1/2 years. 4. In the 1962-63 printers' strike that shut down New York City's daily newspapers for 114 days, Harry was editor of the Daily Strike Bulletin. 5. As the legislative director of the Physicians Forum, Harry played a key role in winning social security for the nation's doctors. 6. In 1968, Harry created and became the first director of Cornell University's Two-Year Labor/Liberal Arts Program. 7. In recognition of his distinguished teaching career, Empire State College created the Dr. Harry Kelber Endowment in Labor Studies. 8. At age 70, Harry became the Educational and Cultural Director of Electrical Workers Local 3, I.B.E.W., a position he held for nearly six years. 9. In 1992, Harry led a week-long seminar in Moscow for 145 labor leaders of the former Soviet Union on the theme, "Democratic Unions in a Market Economy." 10. In 1995, at age 81, Harry ran for a vice president seat on the AFL-CIO Executive Council to force the first election ever, in which a rank-and-filer challenged incumbent officers. Click here to purchase 'My Seventy Years in the Labor Movement. Harry Kelber's poetic commentary on "CEO Lust,"
delivered at Labor Notes conference May 2006. You can see and hear Harry reciting his poem by clicking below. You can read Harry's poem by clicking here.